Clydebank relinquished their grip on the Sectional League Cup this evening after going doing down by three goals to one at Petershill, mainly due to a rather pedestrian first half performance. A change of personnel at the break led to a much improved showing in the second half, but with Petershill already two goals up a comeback never really looked on. A fluke goal put the home side further ahead, and Nicky Little’s counter turned out to be nothing more than a consolation. Kieran McAnespie made a number of changes to the line up, most likely due to a demanding run of fixtures over the next few weeks. Several key players were missing from the starting line up with Morrison, Dooley, Paterson, McLean, Alexander and Black all coming in. 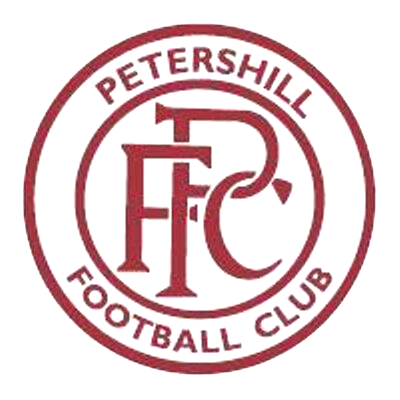 The match was barely seven minutes old when Petershill took the lead. Nothing of any note had happened up to that point bar a free kick by Gold that was comfortably touched over the bar by Morrison. 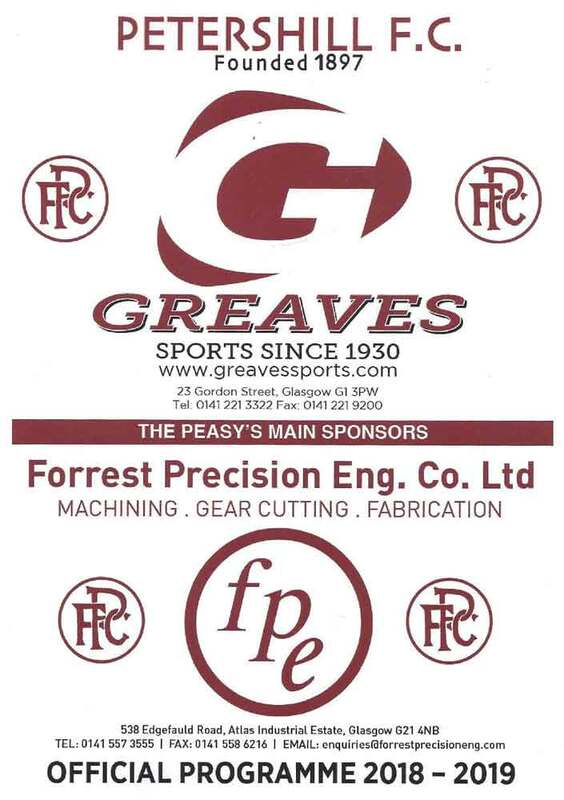 The goal came from a hard hit, low ball into the box that was steered towards goal by Cassells. His connection on the ball wasn’t true, but it looped up and was far enough away from Morrison to land in the back of the net. Clydebank tried to respond, and McClair on one of his few active parts in the game raced to the bye-line to cross low to the near post for Higgins, who could only get his toe on the ball prodding it wide of the target. The Bankies managed to get the ball in the net after twenty minutes when a sweeping move down the left wing saw a cross low into the six yard box. A Petershill player managed to clear under pressure from McClair, but he only succeeded in kicking the ball to Higgins, who drilled it into the back of the net. The ref chopped off the goal for what can only have been an infringement by McClair on the defender as the reason wasn’t particularly clear. As the half moved towards the final third Petershill were becoming the dominant side and had a great chance to increase their lead after 38 minutes. A Peasy midfielder cut inside from the left and split the Bankies defence with a great reverse pass, putting Cameron clear on goal. He rolled it past Morrison only to see the ball finish on the wrong side of the post. He really should have scored but three minutes later he made up for it when he got on the end of a cross from the right hand side. He seemed to have acres of space to head past Morrison from close range. The Bankies had been very laboured for much of the first half. The back four, particularly McLean, were guilty of aimless long punts up the field trying to play the percentages, but it is hard to blame them for this as the lack of movement in front of them was denying any chance of linking up any other way. Time and again, the defence would pass the ball about looking for someone to show for them, only to end up with no option to go long and generally losing possession as a result. The wide men, Hepburn and McClair, were particularly to blame and it was no surprise when McAnespie hooked both of them at the break. Nicky Little and Sean Higgins came on in their places, with Alexander and Black moving to the wider positions. Without being a revelation, The Bankies played much better in the second half, as everyone was now working hard and trying to get involved. Nicky Little made a huge difference playing in the advanced midfield role and Chris Black gave the left back a lot to think about. 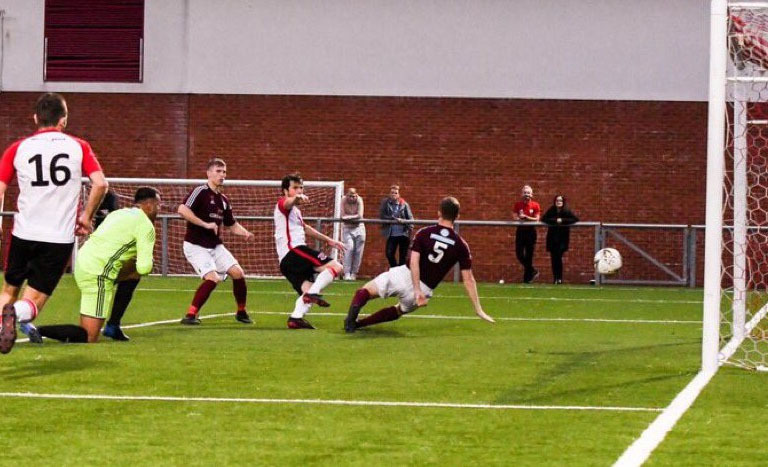 However, the Bankies found themselves three down just six minutes into the second half, when Scott Cameron fluked the ball into the net from an incredibly tight angle on the right had shy line. Obviously, it was an attempted cross but he hit one of those once in a lifetime balls that sailed over the top of Morrison’s head and into the net. It was unfortunate as the Bankies had just had their best spell of the match. Started by Little, who drove towards the box, giving Sean Higgins a chance. The Bankies forward had two shots blocked one of which led to claims of handball. The Bankies did get a goal back on 56 minutes. Chris Black competed well for the ball and cross for Stevie Higgins who was unlucky to see his shot come of the post. Nicky Little reacted quickest and fired the ball into the net. After that, the home side regained their composure, and were never truly under any threat again. The Bankies had a lot of the ball and pressure, but didn’t open up the Petershill defence who were quite happy to try and kill the game on the break. The best chances fell to the home side in the last fifteen minutes, one in particular where Cameron could have grabbed a hat trick but for a fine stop by Morrison at his back post. The Bankies threw on Jamie Darroch as a striker in a desperate attempt to retrieve the scoreline, but Petershill held on quite comfortably. It was another disappointing performance, as it seems several players have lost form all at the same time. McAnespie has a lot to think about before the Bankies head to Kilwinning for another challenging away match. At least the second half showed an improvement and it is hopefully something to build on.